December | 2014 | Dorothy Day Catholic Worker Washington, D.C. In Matthew’s account, magi from the east go to Judea in search of the newborn king of the Jews, having “seen his star in the east”. The King, Herod the Great, directs them to Bethlehem, and asks them to let him know who this king is when they find him. They find Jesus and honor him, but an angel tells them not to alert Herod, and they return home by another way. 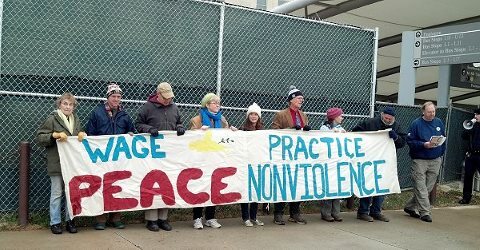 On December 29, over 50 people from the Atlantic and Southern Life Communities held a nonviolent witness at the Pentagon to commemorate the feast of the Massacre of the Holy Innocents (the actual feast was on Sunday, December 28). The noon-time witness began with a procession in which participants carried banners and signs from Army Navy Drive to the designated “protest” area located near the Pentagon south metro entrance. The lead banner, carried by young adults, read: “Peace To All Children of the Earth.” Upon our arrival we encountered a sizeable Pentagon police presence who directed everyone to go into the fenced off designated protest area. Ten did not comply and proceeded farther along the building side of the sidewalk holding a large banner that said “Wage Peace–Practice Nonviolence.” I also held a sign which said “Love Your Neighbor Means Don’t Bomb, Occupy and Kill Them!” At first, it appeared the ten of us would be stopped. But surprisingly, we were able to move farther down the sidewalk so that we could face the rest of the community who were directly across from us behind the fence in the police designated protest area. Upon giving a brief explanation about our witness, the police gave the first of several orders for the ten of us to leave the sidewalk or face arrest. The Gospel account of the massacre of the Holy Innocents was then read (see above). This was followed by a Litany remembering all those who have been massacred–past and present- by the Herod’s of our world, with a particular focus on those who have been slaughtered by U.S. military forces. We began by recalling that in 1890, on this very day, the 7th Calvary Regiment slaughtered nearly 300 Lakota men, women and children at Wounded Knee Creek. We then enumerated contemporary U.S. massacres and remembered and prayed for all victims of our warmaking empire and all victims of violence. After each prayer the community responded: “God Forgive US!” As we concluded the Litany, the police gave the last warning and began to place the ten under arrest. As the ten of us were being handcuffed we sang the song “A Voice Is Heard In Ramah.” The arrested were then taken by police to the Pentagon police processing center, which once upon a time served as a day care center. The ten who were arrested were processed and charged with “Failure to Comply With a Lawful Order.” All were released and are scheduled to appear for a March 19 court date at the U.S. District Court in Alexandria, VA.
Here’s a link to excellent photos and video taken by our great stealth photographer: http://1drv.ms/1rwyxa6. Due to a number of factors, there will not be a Holy Innocents Faith and Resistance retreat this year. There will, however, be a nonviolent witness at the Pentagon to commemorate the Massacre of the Innocents (see below announcement). If you are able to join us please let us know. Contact Kathy Boylan at 202-882-9649 regarding hospitality. And p lease share the below information with other friends. S. Eads St. @11:30 a.m. Witness at Noon. Please join members of the Dorothy Day Catholic Worker and Jonah House communities and other peacemaking friends in a nonviolent witness to commemorate the Massacre of the Holy Innocents – past and present. We will also proclaim, in the form of New Year’s Resolutions, our hope for a world of nonviolence, peace and justice. Please bring a resolution to offer during this witness. Let us pray for each other during this Holy Season as seek to make the Word flesh in building, ever wider and stronger, the beloved community. Let us recommit ourselves to ending the slaughter of innocents everywhere. Contact: Dorothy Day Catholic Worker: 202-882-9649, artlaffin@hotmail.com and Jonah House: 410-233-6238, disarmnow2@verizon.net.